Lessons learned in beauty & in pain. Tomorrow is my 28th birthday. 27 was good, but dang am I ready for 28! It is going to be MY YEAR, baby! I don’t say that every year, don’t worry. 2. I mutually decided to breakup with my boyfriend – no drama, no big argument, no he-said, she-said – it just wasn’t working. hey, adulthood. 7. I started this blog! 9. I picked up a new hobby – road biking – and by picked it up I mean I just began. 10. I colored my hair 4 times, which is 4 more times than the past 5-6 years. 11. I started teaching a cycling class! 15. I briefly mastered the deadlift… then stopped doing it for a couple weeks and now need to work on form again. 16. I created a list of bills with their due dates, minimum payment amounts, a box to mark how much I paid and what date I paid them (we meet again, adulthood). 17. I started to understand what grace from my Heavenly Father truly looks like. I haven’t totally figured it out, but I’m getting there. 21. I stayed at my first all-inclusive resort. 23. I watched an Iron Man in person, in Mexico. 24. I rode in a Tesla, and got to see a Tesla being made. 26. I did my own wine and paint class, and then did it again. 27. I weighed the most I ever have. That’s what happens when you get older, right? I have a hard time avoiding comparing myself to others. No matter what it is – at the gym, at work, out shopping, reading others’ social media updates – I find a way to compare myself to just about every one around me. I have made MUCH improvement in this area since my college years, but it is still a battle I fight. 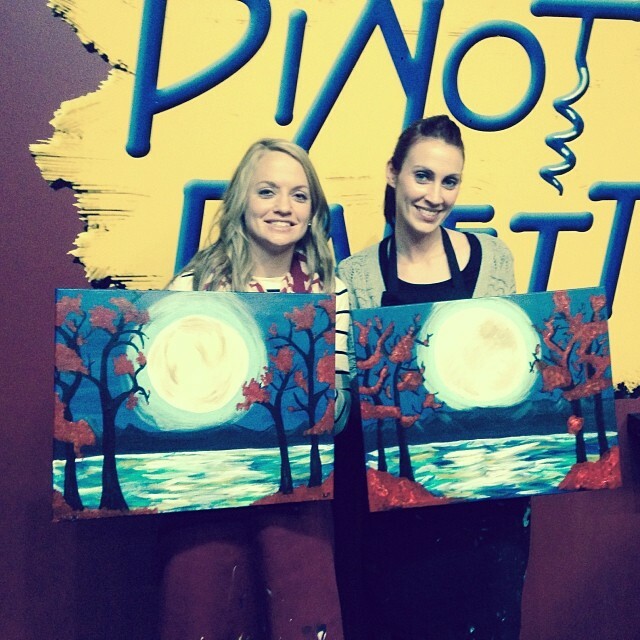 My friend and I went to one of those trendy paint a picture and drink wine places the other night. We entered a room full of empty white canvases. It was quite overwhelming as we looked at the picture we were supposed to have at the end of the night and back at our blank canvases. We started talking about how impossible this seemed and how there was no way our paintings would turn out like the one at the front of the room. So, we got to it. We painted our hearts out. The first few tasks we thought we were really screwing up – we kept looking around and noticing how much better everyone else’s pictures seemed to look. The more I looked at the art around me the more disappointed I got with mine. But then… I decided to stop. Not just to stop looking around but to stop caring what their pictures looked like and start thinking about how I could improve mine. So we kept painting, and we both started to agree we were pretty proud of our work so far. We were doing it! We were making beautiful creations from a blank canvas. Both of us work with preschoolers, and both of us agreed sometimes our client’s draw better stick figures than we do. We are not artists, but once we stopped caring about everyone around us, we started seeing the beauty in our own work. Then, disappointment hit us again as we were finishing up the pictures and again started comparing ours to those around us. Until we were standing alone, only able to see our own. Wow, we actually did a good job. These paintings actually look like the one on the wall, and we did every single bit of it! Look at us and our beautiful paintings! Wahoo! So, as I was thinking that night, I realized how much comparison really can steal your joy in your own beauty. If you focus on improving yourself and the things you like about yourself, you can feel very good about yourself, just how you are. But the minute you start looking at what others have, what others can do, etc. your own view of yourself seems to decrease and you start realizing all the improvements you need to make, things you need to change, and things you wish you’d never had done. Your joy starts slipping away. 1. spend 10 minutes each morning in solitude and prayer with God. 2. I will memorize one verse of scripture each week for the next month. Don’t go crazy and make some improvements that you can’t keep. Notice I didn’t say I was going to memorize scripture for the whole year. I know myself, I know I’ll mess up and get upset with myself. So stop comparing. Start loving the things that make you just the perfect little you that you are! be strong and courageous [community].